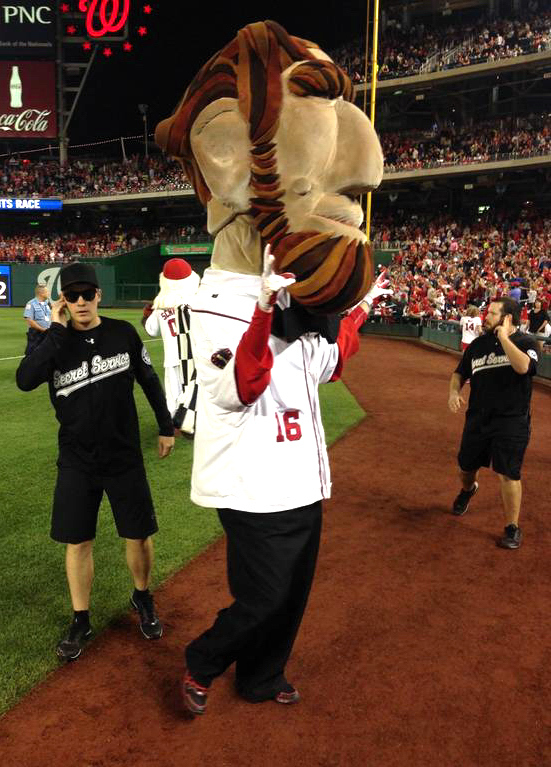 September | 2014 | Let Teddy Win! 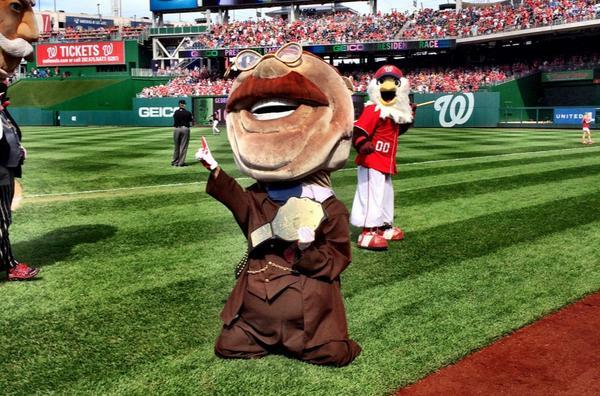 With a win Friday afternoon at Nationals Park, the Nats clinched home field advantage through the playoffs, but Teddy Roosevelt’s magic number stayed stuck at one, as “Honest” Abe Lincoln cheated his way to two victories in the day-night doubleheader, pulling into a tie with Teddy Roosevelt atop the presidents race standings. The afternoon game featured $1 ice cream cones, so it was no surprise when “Nice Cream Cone” made a return appearance to Nationals Park during the presidents race. 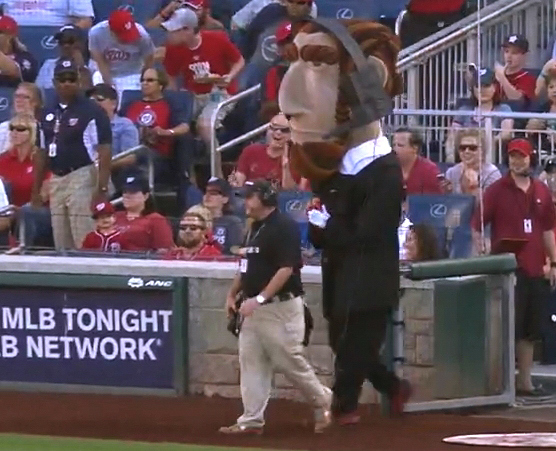 The giant dessert first went after Lincoln, but then took down all of his opponents, leaving a clear path for the Great Emancipator to take the opener. 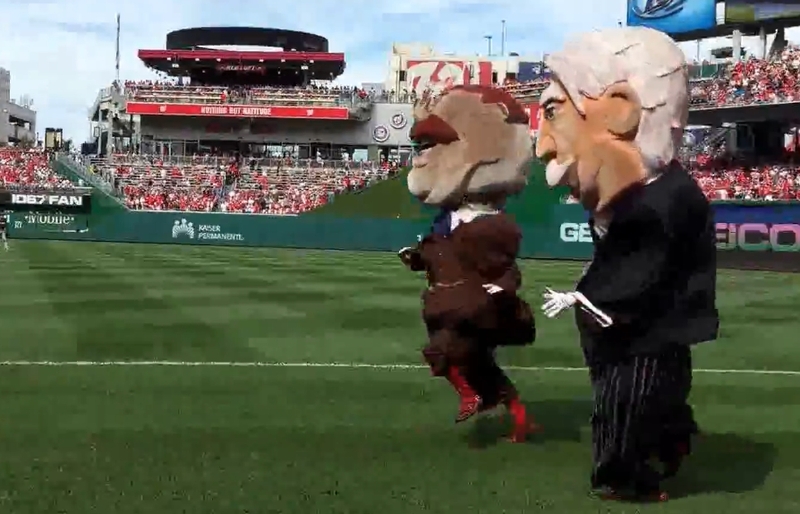 In the nightcap, Lincoln enlisted the Secret Service to clear a path to the finish line, first clotheslining Teddy Roosevelt in the outfield, then tackling Washington, Jefferson, and Taft while Lincoln preened for the fans. 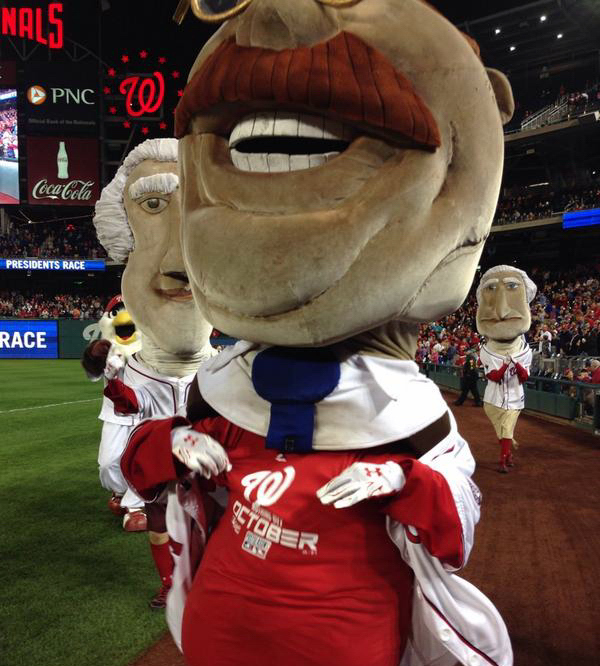 Abe’s antics ensure that the 2014 presidents race title will come down to the final game of the season. 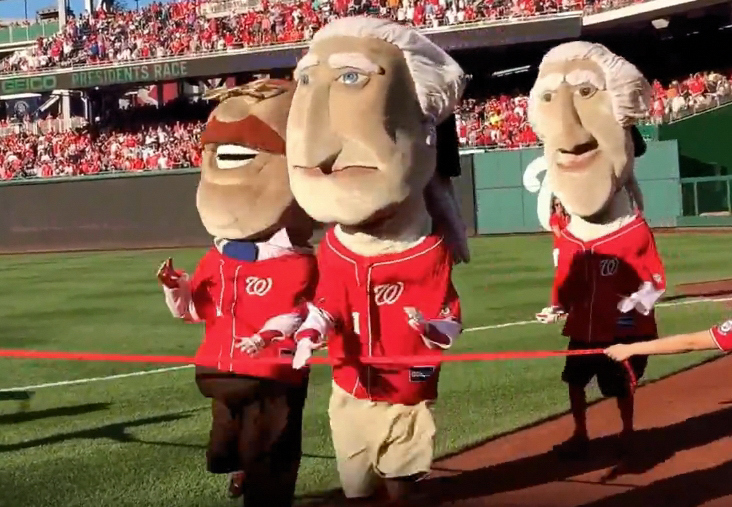 For the final game of the Nationals’ “Patriotic Series” Wednesday at Nationals Park, the racing presidents wore their patriotic blue jerseys and stopped along the first base line to pass out flags to the crowd. 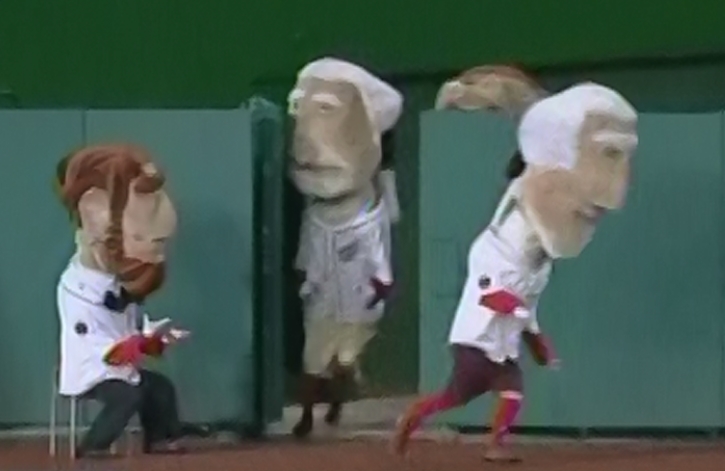 Abe Lincoln, who had been trailing the pack, snuck by his fellow presidents and stole his third straight win. 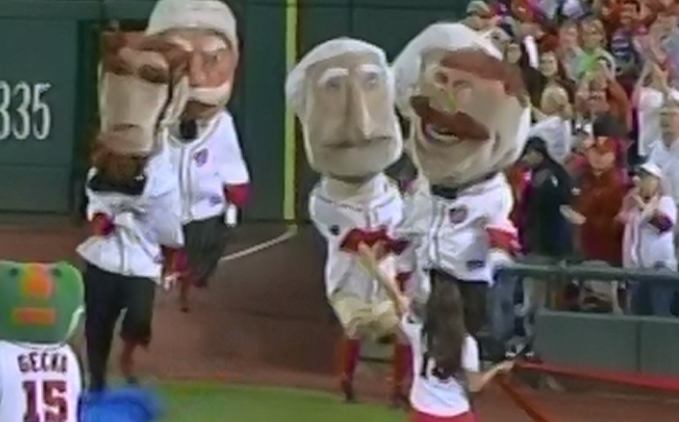 With the victory, the Great Emancipator took four of six races in the first homestand of September — as many victories as he had in all of July and August combined — and closed the gap with Teddy Roosevelt for the 2014 presidents race crown. Teddy’s magic number entering the final homestand of the season will remain at 2, setting up an epic showdown for the end of September. 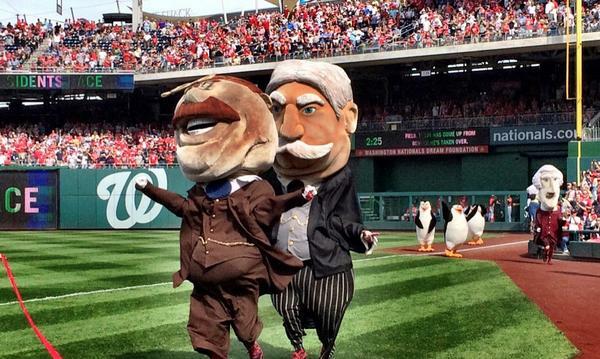 Apparently, Abe Lincoln will do just about anything to keep Teddy Roosevelt from clinching his first presidents race championship. 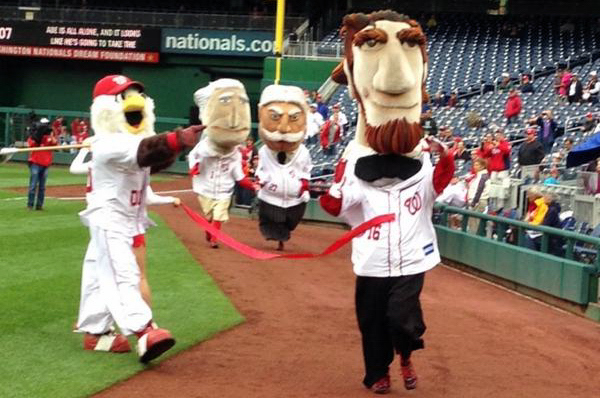 With just eight home games to go, “Honest” Abe couldn’t afford to let Teddy win more than one more race. 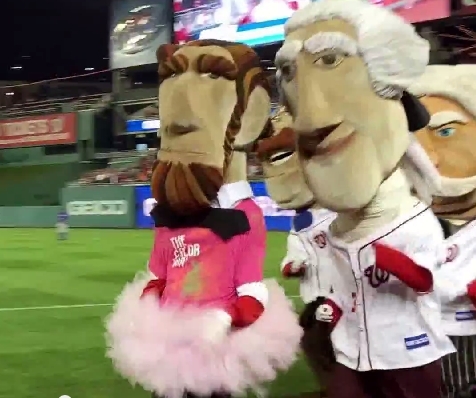 Yet as the fourth inning contest began Tuesday night, Lincoln sat on a chair and let his competitors run by. 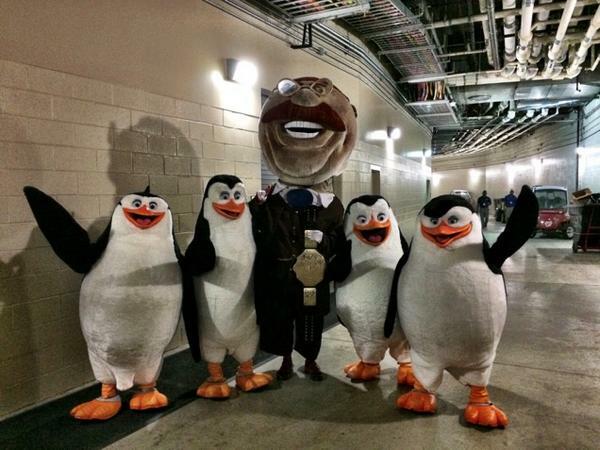 The reason became clear as the presidents reached the home stretch with Teddy in the lead. George Washington reached out and grabbed Roosevelt by the uniform, dragging him back to clear a path for his compatriot from Illinois. 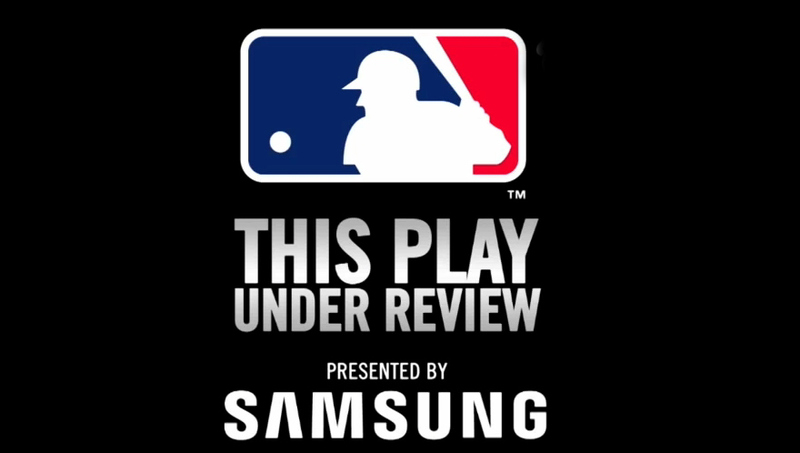 The flagrant cheating was ignored by race judge Screech, and Lincoln took the tape to close within 4 games of Teddy with eight remaining. Roosevelt’s magic number remains at 2.